Cute and Cozy Cabin near Heavenly Village is a self-catering property situated in South Lake Tahoe near South Tahoe Ice Arena. This property offers access to a balcony and free WiFi. The holiday home has 2 bedrooms a living room and a kitchen with a dining area. A TV is provided. 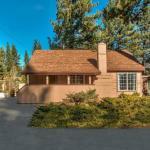 Tahoe Queen is 3.2 km from Cute and Cozy Cabin near Heavenly Village. Reno-Tahoe International Airport is 67 km from the property.